Wednesday April 24th 1889 Adda finished the ironing this forenoon. I worked on my quilt a little and helped do the work. I rode to town with Will in the waggon soon after dinner. I spent the day time with Hatt. I stopped on the way home to see about buying a second hand incubator. I worked on my quilt in the eve. Thursday April 25th 1889 It was a foul day. Mother went over town and she and Hatt went to the valley. I was busy with the work most of the forenoon. I cleaned up the chicken yard in the afternoon and worked on my quilt. Will put in the afternoon looking for help. The boy he got two weeks ago is home sick and left tonight. Will to town in the eve. Mother did not come home. Friday April 27th 1889. It was a fine day. I worked out doors some in the morning. Mother came home about noon and very soon Aunty Walker came to spend the day. We had a pleasant visit. I worked on my quilt all day. Saturday April 27th 1889 It was a cold windy day. I went over town early. In the morning and Hattie came home with me to spend the day. The children were already here. Mother went home with them in the evening to stay all night. Will was in the valley fixing fence part of the day. When he came home he brought the incubator I think of buying. Sunday April 28th 1889 I was busy about the work all forenoon. I read a little in the afternoon and wrote to Mary Woolf in the evening. Mother went to the valley in the afternoon with Ott I put the eggs in the incubator in the afternoon. John & Hatt were over awhile. 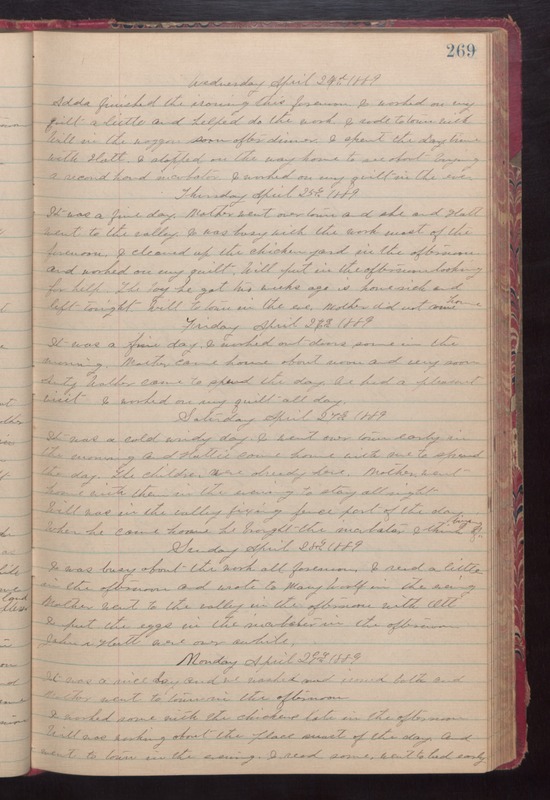 Monday April 29th 1889 It was a nice day and we washed and ironed both and Mother went to town in the afternoon. I worked some with the chuickens late in the afternoon. Will was working about the place most of the day and went to town in the evening. I read some, went to bed early.